Zach (“DJ Z”), resident DJ at Soul Sanctuary Dance since 2006, loves to dance to a wide variety of music, and is constantly trawling the rich musical universe for far-ranging music to help us to get moving, and to be moved. His dance roots are in house parties and the Funk of the 70s. He personally test-dances each song he plays, in his basement home office. 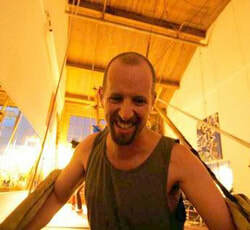 DJ Dadada (Daniel Ari) began DJing at Soul Sanctuary in 2010—after 20 years of dancing at Bay Area boogies. Inspired by 5Rhythms dance, his playlists have a reliable wave shape, starting with a gradual warm up (or sometimes a "hot up"), reaching a peak of tempo and energy, and ending in a cooling denouement. He also likes compiling playlists around themes. Prior playlists have centered on jazz, Latin rhythms, songs about fire, outer space, whimsy, and jumping. DJ Mick (Michelle Blair) has been dancing ever since she can remember. Modern, African, samba, swing, the hokey pokey – she brings it all to the dance floor. It was dancing to Soul Sanctuary’s eclectic mixes that got her thinking in songlists, and, before she knew it, she became a resident DJ. Drawn from all genres, her sets are sassy, soulful and sweet – and filled with surprises! DJ Farzana creates an exotic and intoxicating journey of beats and grooves to transport your mind, body and spirit through various states of movement and consciousness. From ambient, to bhangra, bass mantras, to funk, disco, world, sacred, reggae, trance and tribal....lose yourself in dance! Introspective to invigorating, it’s all blended in there, from the yin to the yang. Valerie's tastes and music offerings are eclectic and broad. She believes that every genre has a lot to offer to our bodies and souls. Her dance practice, curiosity and love for music brings her to continuously discover new tunes. Witnessing dancers move, shape and shift brings joy and inspiration to her heart. Valerie is a co-founder of Soul Sanctuary Dance. Herb is still trying to figure out what music is, but he understands the joy it brings his life. Before he was diagnosed with Parkinson’s disease, Herb was an experimental pop composer, and avoided dancing at all costs. In 2007 he stumbled into a dance class for Parkinson’s, and began to practice conscious, creative movement. As DJ, Herb likes to play music for your head, heart and hips: quirky, inventive, often intricate music with soul that grooves!